(ZIZ News) — After receiving a warm reception at Port Zanté, Prince Henry of Wales headed to The Brimstone Hill Fortress National Park for a Youth Rally and talent showcase on Wednesday. 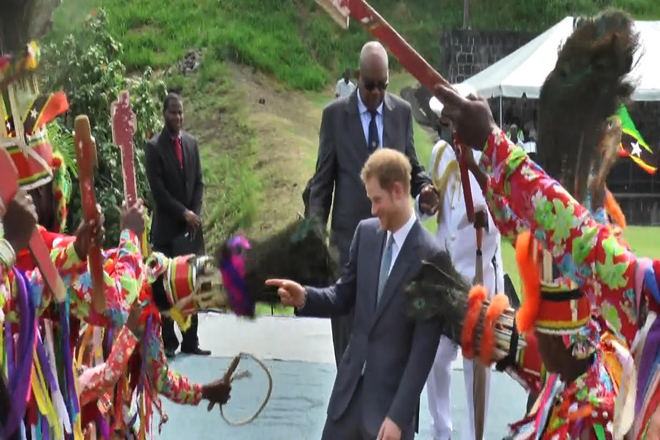 Despite the unfavourable weather conditions, government officials, local leaders, residents, teachers and students were seen at the Brimstone Hill Fortress Park eagerly anticipating the arrival of Prince Henry of Wales, commonly known as Prince Harry. The Prince arrived via a special convoy after participating in The Guard of Honour at Port Zante. Upon arrival the Prince was given a Kittitian welcome from onlookers and the Sylvester’s Masquerade group who formed a shield around him as he made his way across the field to his designated seating area. Prince Harry was given the opportunity to watch traditional dances and listen to local poetic pieces among other selections. Among them were pieces by The Cayon High School’s Steel Orchestra, The Basseterre High School’s Orchestra the Basseterre High School Dance Group and the Saddlers Secondary School’s choir. The Sugar Mas 45 National Carnival Swimsuit contestants were also present during the ceremony. Soca artist Dejour Alexander performed a few of his hit songs and kept the youth quite involved. The Youth Drum Corps accompanied by Royd Phipps gave an entertaining selection on African drums. It was this performance that saw members of the audience cheering as the lead drummer made his way to Prince Harry, giving him a chance to perform a drum solo. Governor General, Sir S.W Tapley Seaton welcomed Prince Harry to the podium and he greeted the audience on behalf of Queen Elizabeth II. “I feel so incredibly lucky to be visiting St. Kitts and Nevis on behalf of the Queen. Her Majesty sends her best wishes to you all and is sorry not to be here personally. On trips like this I am extremely fortunate to meet dignitaries and leaders from many fields, but what is most important to me is having a chance to meet with young people of the countries that I visit”, the Prince expressed. The prince also mentioned how impressed he was with the youth’s performances. “There is no better way to judge the future of a country than by spending time with its youth, taking the time to listen to what they have to say and understanding their vision for the nation they will inherit. Those performances show that the young people of St. Kitts and Nevis have creativity in bounds which are two qualities that will set you for the future I have no doubt. So well done and thank you so much for sharing your talent with us”, Prince Harry said as he smiled at the audience. Prince Harry then unveiled the St Kitts and Nevis dedication to the Queen’s Commonwealth Canopy Project which was presented in form of a plaque. The Queen’s Commonwealth Canopy is a unique network of forest conservation initiatives, which involves all 52 countries of the Commonwealth. Later on during his visit to St. Kitts, an investiture ceremony was held in the State Room at Government House where former Governor General of St. Kitts and Nevis, His Excellency Sir Edmund Lawrence, formally received his knighthood from Prince Harry acting on behalf of Her Majesty the Queen.